Civic I/O’s Civic Tech Pitchers: Where are they now? Civic I/O wrapped up their 4th conference during SXSW where almost 30 mayors gathered in Austin, Texas to discuss new ideas in emerging technology policy, futurism, digital inclusion, and service design. 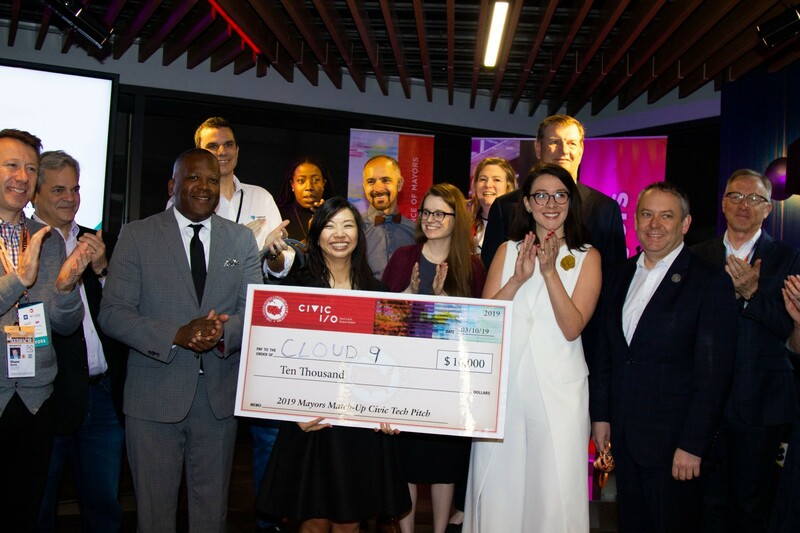 The conference culminated with the announcement of Cloud9 as the winner of the 3rd annual Civic Tech Pitch Competition. As Civic I/O 2019 draws to a close, we turn our attention to some of the 13 startups from 2017 and 2018 that are thriving and working in cities all over the United States. Over 150 applications from innovative startups have been submitted over the years, all for the opportunity to pitch their civic solution to a room full of mayors in hopes of gaining not only business, but validation of their solution and credibility as a needle-mover in cities. Over the last 12 months, Biobot has harnessed the media coverage of their win to build credibility and a reputation, and to educate customers/government about their technology and the issues they are tackling. Since the competition, they graduated from Y Combinator, raised $2.5 Million, and are working to sign several contracts with cities this year. “Civic I/O put us on the map. We are selling a technology that is totally new. It not only lent credibility to what we are doing, but helped socialize and educate our mission with folks. That has been invaluable to us.” Ghaeli said. Biobot plans to continue to scale and launch in more cities across the United States. SeamlessDocs, another competitor from 2018, is a platform that turns PDFs into smart forms for government, a key to equally accessible government services. SeamlessDocs entered the competition at a later stage in development; they had over 40 employees with $20 million raised, working with hundreds of governments and pitching a new product rather than a company. “While we work with hundreds of governments, getting mayors’ feedback is difficult, and so for that it was invaluable. Gaining the mayors’ stamp of approval gave us confidence to double down with accessibility as one of our core values,” CEO and cofounder Jonathon Ende said. SeamlessDocs launched their accessible web forms pitch at Civic I/O, and digital accessibility remains a priority moving forward. They are expanding these services and providing tools that are accessible and compliant out of the box for governments that are not giving a fully accessible online experience. In contrast CityGrows, a pitcher at the very first Civic Technology Competition in 2017, is a bootstrapped cloud platform that allows governments to digitize and automate their processes and workflows. Their self-service, low-cost tools help any government, big or small, to digitize building permits, business licenses, and pretty much any internal or external processes. They were a 2-person company and had been live in the market for one year prior to pitching, and since then have grown to serve more than 20 municipal and county governments in 5 states. Because they haven’t taken traditional venture capital investment, they are able to keep costs low and make sure their business model and values are aligned with their government clients’ interests. Civic I/O has since seen an increase in applications for digital service providers for government. Another of this kind, Citymart is a platform for city government employees to deliver better services, connecting them to innovative and diverse vendors as well as procurement tools. Citymart has experienced substantial growth and change since they pitched in March of 2018; a shift to a focus on transactions from the subscription model they utilized. In the last 6 months they have multiplied the number of procurements by 20, they lowered the cost per transaction from $45K to $1K, and as a result saw a huge uptick in women and minority owned (42% of bids) and smaller businesses (90% of bids), otherwise disadvantaged vendors doing business with city government. Boundless, another 2018 competitor has on the other hand grown as a result of a changing political climate around their civic challenge: immigration. In the last year, Boundless has grown dramatically to become the largest provider of marriage green card applications in the country, and after releasing the product they pitched at Civic I/O, clients have been able to complete their citizenship applications in under an hour on their phones. They have assisted over 30,000 people over the last year in their immigration process, and have a 100% approval rate. Boundless is in a unique position as a civic tech company in a field that is severely lacking in data. Cofounder and CEO Xiao Wang said, “In over a year there have been dramatic and frequent changes to immigration from a policy perspective…What we are striving to do is shine a light on these things, and produce a perspective on these things because no one else has this data.” Boundless has submitted public comments using their own data and has gotten hundreds of other leaders and ceos to sign on to our research and reports to talk about how these policy changes are bad for business. Wang said, “Civic I/O is a unique experience where you get the perspective of these civic leaders that can give you the insights and connections needed to grow your company in the right way. We don’t sell to the government, but this was a unique opportunity to understand the types of issues these leaders are concerned about for their constituents”. RideAlong, the winner of 2017’s pitch competition is getting acquired by a startup called OpenLattice. RideAlong is a pre-arrest diversion tool for law enforcement and for residents who frequently interact with 911 dispatch system. The tool provides an actionable way for police officers to determine what actual steps can be taken, and a clean way for field officers to collect data in the field. They are working hard at expanding the users and thinking where it fits in the larger platform. After Civic I/O 2017, RideAlong harnessed their momentum to participate in Y-Combinator. That summer, they began working with Seattle Police Department and in 2018 they expanded to different types of organizations and agencies such as a pilot with San Francisco Department of Public Health through Startup In Residence. RideAlong expects to continue expanding to other cities and states in the U.S. as they grow. Civic I/O is a network of innovators and instigators committed to the hard work of progressing their cities.